What Ancient Indian Did for Us? -India was the richest country on earth till the British invasion in the 17th century. -India has never invaded any country in her last 10,000 year history. -India invented the Number System. Zero was invented by Aryabhatta. -The world's first university was established in Takshila in 700BC. More than 10,000 students from all over the world studied over 60 subjects. The University of Nalanda built in the 4th century BC was one of the greatest achievements of ancient India in the field of education. -Ayurveda is the earliest school of medicine known to man. Charaka, the father of medicine consolidated Ayurveda 2500 years ago. Today Ayurveda is fast regaining its rightful place in society. -The art of Navigation was born in the river Sindh 6000 years ago. The very word 'Navigation' is derived from the Sanskrit word NAVGATIH. The word navy is also derived from Sanskrit 'Nou'. -Bhaskaracharya calculated the time taken by the earth to orbit the sun hundreds of years before the astronomer Smart. Time taken by earth to orbit the sun: (5th century) 365.258756484 days. -The value of pi was first calculated by Budhayana and he explained the concept of what is known as the Pythagorean Theorem. He discovered this in the 6th century long before the European mathematicians. -Algebra, Trigonometry and Calculus came from India; Quadratic equations were by Sridharacharya in the 11th century; The largest numbers the Greeks and the Romans used were 106 (10 to the power 6) whereas Indians used numbers as big as 1053 (10 to the power of 53) with specific names as early as 5000 BC during the Vedic period. Even today, the largest used number is Tera 1012 (10 to the power of 12). -According to the Gemological Institute of America, up until 1896, India was the only source of diamonds to the world. -USA based IEEE has proved what has been a century-old suspicion in the world scientific community that the pioneer of Wireless communication was Prof. Jagdeesh Bose and not Marconi. -The earliest reservoir and dam for irrigation was built in Saurashtra, Gujarat (Western India). According to Saka King Rudradaman I of 150BC a beautiful lake called 'Sudarshana' was constructed on the hills of Raivataka during Chandragupta Maurya's time. -Chess (Shataranj or Ashtapada) was invented in India. -Sushruta is the father of surgery. 2600 years ago he and health scientists of his time conducted complicated surgeries like cesareans, cataract, artificial limbs, fractures, urinary stones and even plastic surgery and brain surgery. Usage of anesthesia was well known in ancient India. Over 125 surgical implements were used. A deep knowledge of anatomy, physiology, etiology, embryology, digestion, metabolism, genetics and immunity is also found in many texts. -When many cultures were nomadic forest dwellers over 5000 years ago, Indians established the Harappan culture in the Sidhu Valley (Indus Valley Civilization). -The place value system, the decimal system was developed in India in 100 BC. Albert Einstein said: We owe a lot to the Indians, who taught us how to count, without which no worthwhile scientific discovery could have been made. Mark Twain said: India is the cradle of the human race, the birthplace of human speech, the mother of history, the grandmother of legend, and the great grand mother of tradition. Our most valuable and most structive materials in the history of man are treasured up in India only. French scholar Romain Rolland said: If there is one place on the face of the earth where all the dreams of living men have found a home from the very earliest days when man began the dream of existence, it is India. Hu Shih, former Ambassador of China to USA said: India conquered and dominated China culturally for 20 centuries without ever having to send a single soldier across her border. WHY then are we not able to use our own ancient knowledge? It is a law of nature that every thing in creation must go through cycles of time. The period of light must be followed by a period of darkness, and period of wakefulness must followed by a period of sleep. And the period of happiness must followed by period of sorrow; otherwise, the human mind will not give the due value to happiness. After a period of sorrow, the happiness that comes next will be much more heartening. Hence, according to that law, the higher psyche of Indians is at sleep now. Will it wake up in the near future? Can we see it during our own lifetime? Yes. Some astrologers, both Indian and Western, have predicted that India will awaken to a part of its prestigious glory in about two decades from now. Rishis selected the words of the Gayathri mantra and arranged them so that they not only convey meaning but also create specific power of righteous wisdom through their utterance. The ideal times for chanting the mantra are three times a day. These times are known as three sandyas-morning, mid-day and evening. The maximum benefit of chanting the mantra is said to be obtained by chanting 3, 11 or 108 times. The syllables of the mantra are said to positively effect all chakras or energy centres in he human body. Gayatri mantra is devoted to God Savitur refers to Sun. Sun here does not imply the sun of our solar system. Rather it implies a Sun of all suns. Sun that it is the source of eternal light that provides life, knowledge and enlightenment. Light that can be illuminate the soul. The earth(bhur), the planets(bhuva), and the galaxies(swaha) are moving at a very great velocity, the sound produced is Hmmm(om),(the name of formless God). That God(tat), who manifest Himself in the form of lights of suns(savithur) is worthy of bowing/respect(varenyam). We all, therefore, should meditate(dhimahe) upon the light(bhargo) of that deity(devasya) and also do chanting of Hmmm(Om). May He(yo) guide in right direction(prachodayat) our(nah) intellect(dhiyo). Why should women not chant Gayatri Mantra? It is widely believed that some of the Vedic Versus are so powerful in nature. Once a women starts chanting these versus regularly, she likely to lose her female-hood character and get manly tendencies developed in physical appearance. In majority of cases, it might cause hormone disturbances in the body`s physical mechanism and disturb menstrual cycle. It is a fact that to keep women in their natural glory and beauty, the ancient scholars did not allow them to chant or recite these versus. They knew precisely all the effects and side effects of what they did. However, they were allowed to do so once they cross their menopause stage, then the chances of disturbances in their body mechanism were minimal. Also the Gland functional in their body stops, at certain age - any further physical growth is minimal. Certainly it was not for any discriminations but purely on the aforesaid reasons and points. 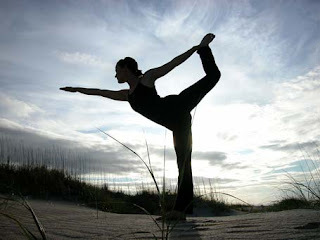 Yoga is a complete science of life that originated in India many thousands of years ago. It is the oldest system of personal development in the world, encompassing body, mind and spirit. Anyone can practice yoga. You don’t need special equipment or clothes – just a small amount of space and a strong desire for healthier, more fulfilled life. The yoga postures or asanas exercise every part of the body, stretching and toning the muscles and joints, the spine ant the entire skeletal system. And they work not only on the body`s but the internal organs, glands and nerves as well, keeping all systems in radiant health. By releasing physical and mental tension, they also liberate vast sources of energy. Many people are first drawn to yoga as a way to keep their bodies fit and supple – good to look at and to live in. Others come seeking help or relief for specific complaint, like tension or backache. Whatever your reason, yoga can be a tool, an instrument for you – giving you both what you came for, and more. Anyone who continues with regular practice becomes aware of a subtle change in their approach to life – for, through persistently toning and relaxing the body and stilling the mind, you begin to glimpse a state of inner peace which is your true nature. Ageing is largely an artificial condition, caused mainly by auto-intoxication or self poisoning. Through keeping the body parts clean and well lubricated, we can significantly reduce the catabolic process of cell deterioration. In recent years, medical research has begun to pay attention to the effects of yoga. Studies have shown, for instance, that relaxation in the Corpse Pose (Shavasana) effectively relieves high blood pressure and that regular practice of asanas and pranayama can help such diverse ailments as arthritis, chronic fatigue, asthma, varicose veins and heart conditions. Yoga literally means `union`. It means union of individual self with the cosmic self i.e. Brahman, as per Hindu scriptures. To be more direct, it means union of man with God. This is the highest goal of mankind, as stated in the holy scriptures, which leads to liberation i.e. Moksha. On attaintment of liberation, one is freed from endless cycles of birth and death, as he has realized the ultimate goal of his life – Godhood. Our scriptures profoundly proclaim, `Thou art that` i.e. you are God. But the truth of this statement has to be discovered by individual himself, before he claims, `I am God`. Compiled by the sage Patanjali in the Yoga Sutras, the Eight Limbs are a progressive series of steps or disciplines which purify the body and mind, ultimately leading the yogi to enlightenment: yamas; niyamas; asanas; pranayama; pratyahara; dharana; and Samadhi. The yamas or restraints are divided into five moral injunctions, aimed at destroying the lower nature: non-violence; truthfulness in word, thought and deed; non-stealing; moderation in all things; and non-possessiveness. The niyamas or observances are also divided into five. Fostering positive qualities, they consist of: purity; contentment; austerity; study of the sacred texts; and constantly living with an awareness of the Divine Presence. Asanas are the postures and pranayama is regulation of breath. Pratyahara means drawing the senses inward in order to still the mind, in preparation for dharana or concentration. Dharana leads to dhyana or meditation, culminating in Samadhi or superconsciousness. 1. Proper relaxation – releases tension in the muscles and rests the whole system leaving you as after a good night's sleep. 2. Proper Exercise- is given by the yoga postures or asanas, which work systematically on all parts of the body – stretching and toning the muscles and ligaments, keeping the spine and joints flexible and improving the circulation. 3. Proper Breathing-means breathing fully and rhythmically, making use of all, not just part, of your lungs to increase your intake of oxygen. Yoga breathing exercises or pranayama teach you how to recharge your body and control your mental state by regulating the flow of prana – the life force. 4. A proper Diet-is one that is nourishing and well balanced, based on natural foods. It keeps the body light and supple and the mind calm, giving a high resistance to disease. 5. Positive Thinking and Meditation-help you to remove negative thoughts and still the mind, ultimately transcending all thoughts. How to get attuned to cosmic rhythms to get Health, Wealth and Happiness in a simple way? Get up each day at least 45 minutes before the sunrise. Find out the dominating nostril. Kiss the corresponding hand. With the same hand, touch or rub face, neck, chest, thighs and feets. Then while stepping out of the bed, the foot that corresponds to the operating nostril should be placed onto the ground first. Then one can proceed for the morning activities. This simple practice called Swara Yoga ( Science of Breath ) helps you align the subtle flow of energy that ensures success in everything that happens for that day. Swara Yoga is an ancient science of nasal breathing that correlates the breath with sun, moon and five elements. The nose can be seen as main switch of cerebral hemispheres. It can stimulate electromagnetic activity on one side of the body and it can switch the hemisphere activity on and off at will.